Get Ready to Do More for Animals May 17-18 – Donations Needed! We are days away from Do More 24 – one of HT’s BIGGEST fundraising days of the year. And we need your help! The timing is different this year! Mark your calendar for Thursday, May 17th and Friday, May 18th. This 24-hour fundraising period begins at noon on Thursday and ends at noon on Friday. In just 24 hours, Homeward Trails can raise $30,000 for our animals. 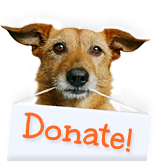 Those funds will go a long way to change the lives of homeless, abused, abandoned and neglected animals. We also have the chance to win thousands of dollars in prize money! Think of how many more lives we can save! All it takes is just $24. Get ready, starting this Thursday at noon. Every single donor counts, so stay tuned for more information. < Spring2ACTION Raises Over $21,000 for the Animals!